Six-year-old Ludwig was sitting at the table, reading his Bible and praying, when Swedish soldiers stormed through the castle door. Ludwig looked up at the soldiers and then returned to his prayer and reading. The soldiers stopped and stared-then left. They said they could not ransack a place that God watched over. An unusually mature Christian at a very young age, Count Nicolaus Ludwig von Zinzendorf (1700-1760) did not follow the course dictated by his noble birth but followed God's call even to the point of being banned from his native Saxony. Once destined for the royal court, the count instead became a spiritual father to millions. 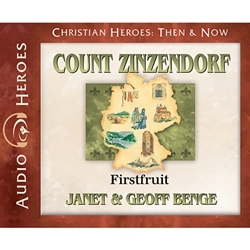 Count Zinzendorf opened his estate to persecuted Moravian Christians, and under his leadership this vibrant community launched the modern missions movement. Beginning at Herrnhut and traveling as far as Africa, America, and Russia, the bold believers of the Moravian Church planted seeds that continue to bear fruit even today.